Sigma has a fondness for the 17-70mm range: the first version of this lens was released in 2006 in the advent of the digital era. It was updated in 2009 with optical stabilization, and then at the 2012 Photokina it was included in the new category of "Contemporary" lens as the 17-70mm ƒ/2.8-4 DC Macro OS HSM "C". The "DC" specification of the lens indicates it was designed to fit the APS-C sensor specifically: Sigma makes the lens available in Canon, Nikon and Sigma body mounts, and shortly the lens will be available in Sony and Pentax mounts. Thus, for this particular lens, it will exhibit an effective focal length of 27-112mm (Canon) or 26-105mm (Nikon and others). The lens is available now with a petal-shaped lens hood, takes 72mm filters, and retails for around $500. The Sigma 17-70mm "C" is surprisingly sharp, especially when compared to its predecessor. The "C" version of this lens uses a different optical formula - 16 elements in 14 groups, including FLD, SLD, and 3 aspherical elements - which no doubt accounts for this improvement. Used wide open, the lens provides very good results for sharpness - if there is a weakness as this setting, it is the wide end (17mm) where we note some light de-centering and some slightly soft corners. The other focal lengths are a bit better, but there are sharper results to be obtained by just stopping the aperture down one position. This is the sweet spot for the lens: at a focal length that's neither wide nor telephoto (23-50mm), and stopped down once (ƒ/4-5.6) you'll be rewarded with tack-sharp images. The 17mm and 70mm settings are excellent as well, but we do note traces of corner softness that aren't ameliorated by further stopping down. Diffraction limiting sets in at ƒ/8, but you really won't notice any meaningful impact on sharpness until ƒ/11: in this case, it's actually the 70mm setting which weathers the best. Stopping down to ƒ/16 provides good results, and even ƒ/22 isn't terrible. While there's been a marked improvement in sharpness, there hasn't been much progress when it comes to chromatic aberration. Given the lens' price point, it's not hugely surprising. Chromatic aberration is handled quite well outside of the extremes in the focal ranges capable of the lens (23-50mm), but at the 17mm and 70mm ends we note some considerable chromatic aberration, which presents as magenta-green color shifts in areas of high contrast. 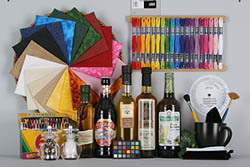 Corner shading is only a problem in two cases: when the lens is used at 17mm, or when the lens is used at any other focal length and at its widest aperture. At 17mm, there can be some noticeable corner shading in the extreme corners when the lens is used wide open (-2/3EV); at any other setting, you may note around -1/3EV. For other focal lengths used wide open, it's just -1/3EV in the corners: any other aperture, and corner shading disappears. When used in the wide angle configuration, the lens provides uniform barrel (''bloat'') distortion up to around 21mm, with very notable distortion in the corners at 17mm (+1%). After 21mm, distortion across the frame remains consistently barrel-distorted, but at a moderately low level (around 0.2%, on average) and the extreme corner distortion turns into the pincushion (''squeeze'') style. The worst results are seen at 34mm and greater, where the corners show almost -0.5% pincushion distortion. Post-processing would be required to correct for these effects. 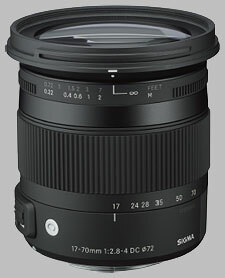 The Sigma 17-70mm ƒ/2.8-4 OS "C" employs Sigma's HSM technology, which allows for fast and quiet autofocusing. Indeed, the lens was able to focus between infinity, close-focus and back to infinity in around one second. Attached 72mm filters won't rotate during focus operations, and there is no lens extension either. Sigma doesn't present the 17-70mm ƒ/2.8-4 OS "C" as a macro lens, but it can achieve 0.34x magnification (1:2.9 reproduction) at a minimum focusing distance of 22cm (just under 9 inches). The Sigma 17-70mm ƒ/2.8-4 OS uses a new material for its construction, ''TSC" (Thermally Stable Composite), making it slightly lighter than its predecessor (470 grams, instead of 535 grams). This drop in weight makes the camera-lens combination nicely balanced, where the previous iteration of the lens became slightly front-heavy. The lens sports a slick new finish which longtime Sigma users may come to appreciate: the previous finish was an all-black matte texture that was very tactile and easy to grip, but tended to break down over time. The lens mount is metal; the filter threads are plastic. There is a distance scale etched onto the focus ring, marked in feet and meters, and there are macro reproduction ratios marked on the lens barrel, visible when the lens is zoomed out (and the lens extends). The lens has two control switches. One switch enables or disables autofocus; the second enables or disables optical stabilization. The zoom ring is rubber with raised ribs, approximately an inch in width. The lens extends as it is zoomed in towards 70mm, growing 1 1/2 inches in length. The ring is smooth to turn, nicely cammed, going from 17mm to 70mm with a 45-degree turn of the ring. The focus ring is also rubber with raised ribs, however it's almost an afterthought at just a quarter of an inch in width. The ring only provides about 45 degrees of turning action, making it slightly challenging for manual focus operations, but providing for faster autofocus speed. The focus range ends in hard stops on either end. The lens hood is petal-shaped and can be reversed onto the lens for storage. When attached, the lens hood adds 1 3/8 inches to the overall length of the lens. See our IS Test for complete image stabilization testing results: in summary, two stops of hand-holding improvement at the 17mm setting, and about three stops at the 70mm setting. The obvious point of comparison is the predecessor lens: in this case, Sigma has made remarkable improvements to sharpness, but that's about it. At the time of writing there are still units in stock for purchase, but that will probably not be the case for long: and really, for the extra $100, you can't go wrong. Canon's comparable lens provides both wider and longer focal length options and is just as sharp; however, it's not quite as fast as the Sigma lens (in terms of maximum aperture). As well, it's somewhat more expensive. Nikon's comparable lens is also slightly wider and longer than the Sigma option, but also doesn't provide quite as wide an aperture. The Sigma is slightly sharper, but the Nikon deals with chromatic aberration slightly better. Pentax's alternative is also a made-for-APSC solution, but instead of offering a variable aperture, it offers a fixed ƒ/4 aperture. The lens is exceptionally sharp, offering slightly more consistent results than the Sigma, but unless you're peeping very closely, about the same. Chromatic aberration is notable in this lens. You certainly pay a premium for the Sony offering in this category, which provides also slightly wider and longer focal length options than the Sigma 17-70mm. However, it's not appreciably better than the Sigma. With the new "Contemporary" 17-70mm ƒ/2.8-4 OS HSM "C", Sigma's created a smart and stylish upgrade to its kit-lens alternative. There's a good recipe for sales here: make it look awesome, and don't jack up the price too much. I've seen the review here which mentions Chromatic Aberration / Purple Fringing being not too well-controlled, but try as I might, I am unable to make this lens produce significant visible evidence of CA . I'm testing it on an EOS 80D, shooting RAW, Adobe Color Space. It may be possible that Sigma has further updated the optics of this lens, but that's unlikely, so perhaps I simply lucked in at the right QC point !? I find myself increasingly leaving my 24-105 F/4L at home and relying completely on this lens for almost everything except ultra-wides, portraits (It does a great job there too, but my preference is for F/1.8 lenses for that) and super-tele work. In short, this lens has surpassed all my expectations. I am on my second Canon APS-C camera, a 60D, and have been using the earlier non-STM version of the EF-S 18-135mm lens. I thought that this camera and lens combo did a pretty good job, and in most bright outdoor travel photo situations compared pretty well against my "better" camera, the 24 MP Sony A77 with the 16-50mm f/2.8. I have had my eye on the Sigma 17-70 for several years, and with this third iteration (the Contemporary or "C" version) when the price dropped to $449 I decided it was time to jump on it. I'm really glad I made the investment because now with this lens I feel like I'm seeing for the first time what an excellent camera the 60D is, especially in conditions of reduced available light. Compared to the Canon 18-135, the additional wide view provided by the 17mm Sigma versus Canon's 18mm is noticeable and much appreciated. It's a lot more compact and has only a little lens creep, unlike the Canon, which has terrible lens creep. Every time I tip the Canon lens down to look at the LCD display on the camera, the lens telescopes out almost to the full length, and I have to recompose the shot. I will not miss the additional zoom the Canon affords because I'm not much interested in photographing sports or birds, and there is no lens I know of that possesses a long zoom range that also has brightness and sharpness. Nearly all of my favorite photos fall into this lens's range of focal lengths. The tests suggested that this lens is in some ways better than the much more expensive Canon 15-85mm, especially at the longer (zoom) end. It is certainly a brighter lens. 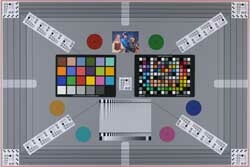 The tests suggest for example that the Canon lens has to be stopped down to f/5.6 to be equal to the Sigma at f/4.0. In additon, a helpful byproduct of having a larger maximum aperture is that the viewfinder is also a tiny bit brighter. The optical stabilizer works great but it does make some odd noises; whirring sounds and the occasional click. For this reason it probably wouldn't make a good video lens. I don't do video so I don't care, but if I want to make videos I already own what is probably the best DSLR for video, the Sony A77 with the 16-50mm f/2.8 kit lens. In conclusion, I think this is the best lens I've ever owned for my Canon APS-C cameras. I'm very happy with it and I can't wait to take some more pictures with it. I've owned all of the earlier Canon kit lenses, the 18-135, the 18-55, and the 55-250, as well as a couple of Sigma lenses, but wish I had saved my money and just bought this one, but of course this lens design is quite new and its previous versions weren't quite as good, so I'm glad I waited until they got it right! Bought it for our holiday. Having previously owned an original 17-70mm, I can safely say that this one is much better in every category plus a bit brighter at the long end and the OS is a bonus. Build is surprisingly good for a price - definitely head and shoulders above the original 17-70. Focusing was spot on without needing to tweak (bar that corner case, see below). This I can tell now after pixel-peeping thousands of photos - very solid performance. In response to a bad press on the internets re: 'soft corners @ wide angle', my observation is that it's only partially true. Yes, some wide landscape shots have soft corners even @ f8, but some others have tack sharp corners even @ 17mm f4 (which was never the case with my old 17-70). I reckon this is due to field curvature: AF picks up sharpness at the centre and leaves corners beyond the field. Will try to adjust AF to focus a bit past near the infinity with USB dock to compensate. Have a look at few samples below - corners are very sharp mid range but a bit soft at the infinity. Will update after I get my hands on USB dock. Overall, I'm very pleased - super versatile and solid performer! A nice addition to my kit that contains a few fast primes. I was excited at the prospect of getting this lens, I purchased a copy.....renders colors beautifully, the bokeh is very nice, the OS is as advertised, but.....(and, the "but" is what I feared from the reviews I'd read)...at the wide end, regardless of being stopped down, the borders and corners are unacceptable (IMO). If you're simply expecting a portrait lens and as such willing to accept optical compromises in the corners, this lens may yet suffice. But for my purposes (and, mind you, I'm not a screen enlarging pixel peeper) I found the center excellent but the rest of the image just TOO lacking. hood and lens cap have weak points in their designs. this lens replaces my previous 17-70/2.8-4. it is lighter, smaller and gives better overall results. optically and mechanically improved over the previous version which was pretty darn good to begin with. it is a more modern approach in its design and feel. no longer (at this point) needs the lens zoom lock due to heavier dampening of the mechanism. the 2 mechanical weakness in it are the hood and lens cap. the hood is a is a good design but when slotted into the camera it has a rather weak connection so one can be concerned about it staying one in relatively rough use. the lens cap works well when placed properly. the inset that drops onto the lip of the lens is difficult to put back on properly with the hood in place unless reversed. both issues are resolvable.